There are hundreds of outdoor markets in Bolivia where you can find an astonishing variety of products. These outdoor markets are crowded, always busy, noisy and frequently don’t smell all that good, but shopping at one can be an interesting experience. Bolivian markets sell everything from fruit and vegetables, poultry, fish and meat, spices, grains, all types of dry and canned goods, flowers, and plants, to gardening and landscaping tools, pottery, clothing, shoes, electronics, kitchen and bath items, cosmetics and toiletries, office supplies, sporting goods, car parts, and much more. You can find many other exotic and strange things at markets in Bolivia too, like the famous coca leaf, sold by the kilo; llama or armadillo meat; love potions and magic talismans; and exotic live animals (frequently endangered species) like toucans, macaws, monkeys and snakes. Even if you’re shy about bargaining in Bolivia, and in fact even if you buy nothing at all, a few hours spent roaming around Bolivian markets can be a really eye-opening experience. Be careful of your wallet or purse and other personal belongings and don’t wear any expensive or ostentatious clothing or jewelry. Foreigners stand out to pickpockets. If you plan to do some shopping at one of the markets in Bolivia, be prepared to bring your own shopping bag (vendors will give you items in separate small plastic bags but you have to have your own market bag to carry them in). Wear comfortable clothing and shoes as the market floors may be dirty or wet. If you plan to take pictures, please be aware that locals are usually not pleased with that, especially indigenous people as some believe your camera captures their soul on film and they won’t get it back. Be polite and ask before you take photos. Be sure you have plenty of loose change and small bills. Many vendors do not prepare in advance and don’t have change available – or simply haven’t sold enough throughout the day to give you change. Read our page on Bolivian shopping etiquette before you go. Final pointers! If, after visiting these markets you find bargaining too challenging, or the place is too crowded for your comfort, you're among many others who feel the same. Traditionally, Bolivian families send their housekeepers to do the market shopping and it's not actually a bad idea for foreigners as well. Your Bolivian housekeeper may be offered much lower prices than you will. Prices are almost always higher for foreigners. Also, be aware you won't get a receipt at any of the markets in Bolivia, many products are imitations or knock-offs, there are no warrantees, and you cannot return items once you've bought them. 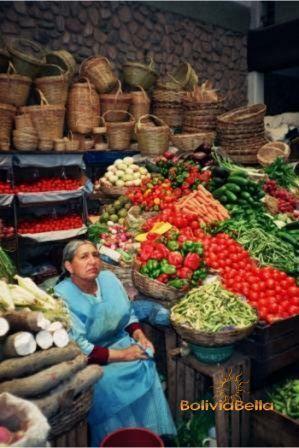 See our page about the Bolivian sales tax for a detailed explanation of these points and how to know when it's best to buy at a market and when it's not. (7 Calles has a small food section and is known more for its huge array of clothing and shoes, shoe repair men on the corner of Plaza Colón, and many, many tailors and fabric shops). Open Monday to Saturday from 9 to 6. (Abasto is best known for produce, plants and flowers, gardening tools and pottery including tiny and enormous flower pots). Open every day from 8 to 6. (Ramada is best known for selling things wholesale (by the dozen or in greater amounts) and for its many, many furniture stores). Open every day from 8 to 8. (Known best for its housewares such as baking pans and molds, and electronics. Also clothing to a lesser degree. More dangerous than other markets – pickpockets abound!) Tip: this market has the highest concentration of pickpockets, most of whom are kids. (Known for its wide array of baked goods, cheeses, food and produce. Very little of anything else is sold here other than edible items). Open every day from 9 to about 4. Located just behind the new multi-modal bus/train station, this market operates only two days a week (Wednesdays and Saturdays from 9am to 6pm) and is HUGE and well worth a trip! It covers several city blocks and people flock to this market for furniture, clothing, household items, electronics, fabrics, school supplies, cosmetics, and everything else under the sun because it is reportedly the cheapest market to buy at. Food and produce are sold here, but to a lesser degree. Before you purchase anything, please read these important shopping tips.